Low fertility in Europe has given rise to the notion of a ‘fertility crisis’. This book shifts the attention from fertility decline to why people do have children, asking what children mean to them. It investigates what role children play in how young adults plan their lives, and why and how young adults make the choices they do. 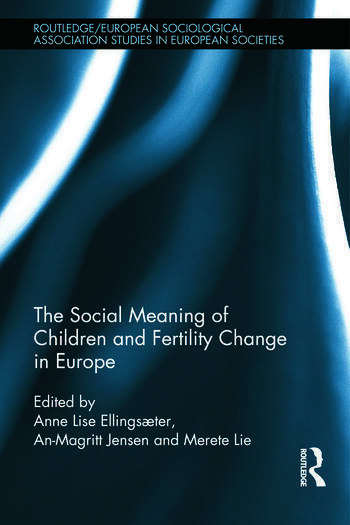 Based on empirical studies from six nations – France, Scandinavia, Denmark, Norway, Sweden, Germany and Italy (representing the high and low end of European variation in fertility rates) – the book shows how different economic, political and cultural contexts interact in young adults' fertility rationales. It will be of interest to students and scholars of sociology, anthropology, demography and gender studies. Anne Lise Ellingsæter is Professor of Sociology at the University of Oslo. An-Magritt Jensen is Professor of Sociology at the Norwegian University of Science and Technology. Merete Lie is Professor in the Department of Interdisciplinary Studies of Culture at Norwegian University of Science and Technology.